Lake addresses some of the profound troubles that afflict the West today with sincerity and humor rather than indulging in cheap polemical potshots a la contemporary conservative news commentators. His sharp yet never caustic wit is on full display in “A Lesson in Hermeneutics” and “A Language Game,” two poems included in The Republic of Virtue. The decline of language — that is, the ease with which definite semantic content is cast off in support of flavor-of-the-month meaning — troubles not just poets and prose stylists, but also citizens involved in any self-participatory government. 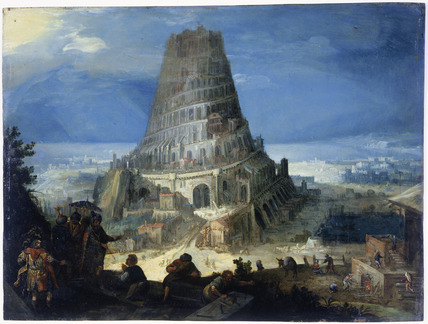 Lake’s poetry shares much in common with Sun Tzu’s emphatic exclamation: “When words lose their meaning, people lose their freedom.” It’s no accident that the cover illustration of the book features Martin Van Valckenborgh’s painting, Nimrod Supervising the Construction of the Tower of Babel. Lake, like many conservatives, recognizes both the good and the bad endemic to pluralism — individuality may be celebrated, but majority unification (a necessity for any democratic republic) becomes ever more difficult. 2013 Richard Wilbur Award and a professor of English and creative writing at Arkansas Tech University, Lake, through his formalist poetry, questions some of western modernity’s proudest achievements, namely, radical feminism, absolute sexual individualism, and technological innovation — all while writing verse that is intoxicatingly poetic. Professor Lake, a former Stegner Fellow here at Stanford, has achieved something exceptional in his lean, 68-page collection in that while his verse has tones of conservative sensibility, his complete poems transcend ideology. Lake brings his traditionalism into conversation with the poetic art instead of subordinating his art to his politics. He taps into the same wide, vigorous vein as other great conservative poets like T.S. Eliot, George Santayana, and Matthew Arnold — none of whom were petty ideologues. The eponymous poem of the collection, “The Republic of Virtue,” demands special attention because of its grim yet fantastically poetic language used to describe the violent radicalism that characterized the French revolution. Invectives aimed at Robespierre are not particularly novel in the conservative canon (see Edmund Burke’s Reflections on the Revolution in France, perhaps the first great modern conservative text) but Lake’s poem descends down from from the realms of political and philosophical abstraction and wades into,“scents of rosewater / Sprinkled on sawdust, bird lime, blood and fungus commingled in the air like a chimera / Exhaled from broken mouths” (18). The first two stanzas from this poem represent some of Lake’s most evocative lyricism. The reader can easily transport himself back to the late 18th century because Lake’s vivid descriptions conjure up the sights and sounds of the frenetic riots on Parisian promenades. Contrasting his high poetic diction are folksy lyrics like the closing stanza from “Terminals”: “Life is a terminal, a narrow rut. / We long for e-mail like an answered prayer. / We wait for something without knowing what. / We surf the Net above the deeps of thought” (25). Many of the poems in the collection have little to do with politics, philosophy, or the West’s downward cultural spiral. Lake adroitly muses about the joys and pangs of parenting, the futility of Wile E. Coyote’s pursuit of the Road Runner, and even the ubiquity of sewage. Standout poems in this category include “Home Free,” “The Plumber’s Song,” and “Underdog and Overlord.” First time poetry readers shouldn’t shy away from the collection just because of its high culture designation. While I’d hesitate to describe Lake’s poetry as “accessible” (that oft used euphemism for simple or unsophisticated), I would say that his verse welcomes the amateur reader with identifiable rhyme schemes and a familiar stanza organization. After the reader settles in, Lake’s poetry encourages — even demands — contemplation even when a poem’s subject matter appears banal at the surface. Perhaps the most genuine praise I can give to Professor Lake is the admission that I, an untutored poetry reader, truly enjoyed reading his verse. For twenty years I’ve binged on rhyme. The poetic intoxication on offer from Lake is potent. Binge away.